One little aspect of this graph irks me. Let me be clear up front: I am not questioning the science behind this plot, or the conclusions drawn from it. I tend to trust consensuses (consensi?) in the scientific community. I also tend to think that people who accuse scientists of swindling the public for their own personal gain don’t understand the attitudes within the scientific community. The most striking feature of this plot is the rise in temperature over the last 150 years or so — the scale of this change is larger than other natural variations on ~100 year timescales, and strongly suggests an external influence (i.e. humans). From David Mackay's "Sustainable Energy -- Without the Hot Air". I don’t doubt that the Industrial Revolution marks a significant milestone in human climate change. However, I am less convinced that these diagrams really show that. This is slightly steeper than exponential, but there’s no sharp knee at 1800. Likewise, most of the things that humans produce (and pollute with) have also grown exponentially over time — electricity, computers, tires, etc. Human growth has traditionally been exponential. 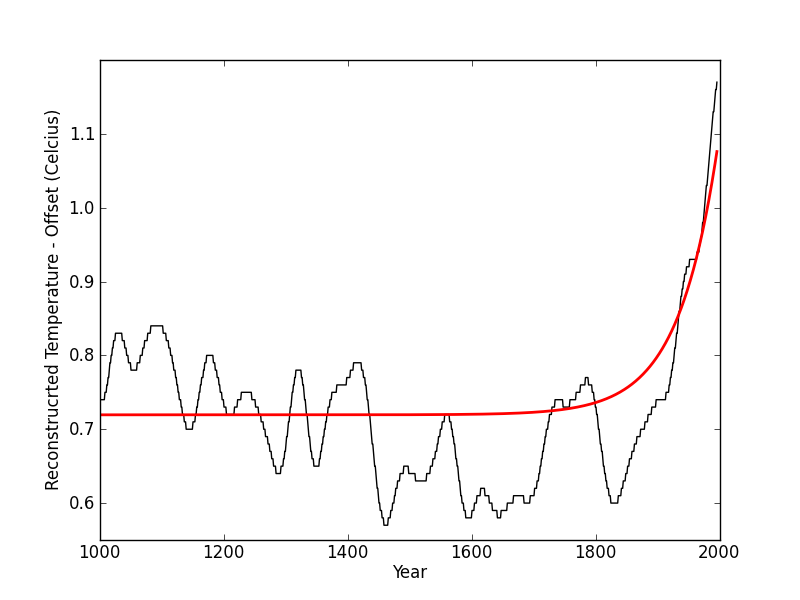 Given this simple observation, my naive intuition would be that the historical temperature record would be broadly described by the sum of two trends: a flat line representative of the earth’s equilibrium temperature, and an exponential curve that encapsulates the growing impact of humans. This model doesn’t account for the bumps and wiggles (due to natural climate oscillations about the equilibrium). But the key point here is this: neither term in this model has a characteristic time scale. The “knee” in the graph represents the time when the exponential human-factor starts to overwhelm the constant term, but there’s nothing special about how the ‘human factor’ is changing around the time of the Industrial Revolution. 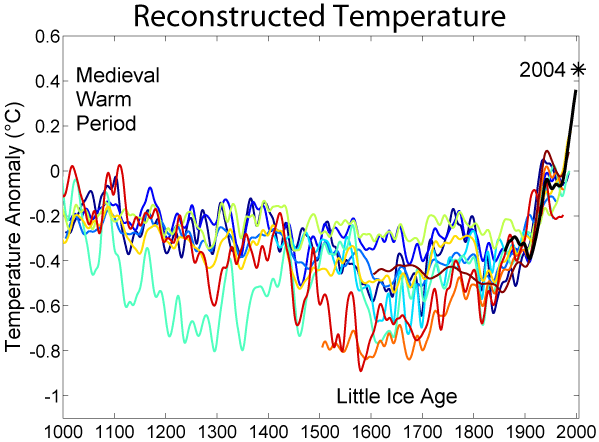 Perhaps it’s a nitpicky point to make, but the hockey-stick diagram on its own doesn’t isolate the Industrial Revolution as the cause of human-induced climate change (other analyses might, of course). Instead, it points to 1800 as the time when human growth (industrial, agricultural, whatever) became significant on a global scale. A more convincing indictment of the Industrial Revolution (and not population growth in general) would isolate the human contribution — and show a knee around 1800. This would more directly show that ‘something changed’ in a distinct way when the Industrial Revolution began. Please don’t quote me as saying the hockey stick diagram is wrong. I’m talking to you, Rick Perry.